When you walk in the doors of W.H. Smith you definitely feel like you have exited France and walked right into England. You'll find pretty much everything you would find in a W.H. Smith book store in the UK including popular British food items... custard, crisps, polo, Cadbury chocolate, mince pies and lots of sweets. The store also carries a large selection of international newspapers and magazines - naturally at a higher price! Well stocked and very friendly book store in the Marais. Not as large as W.H. Smith but a more personal store where the owner is very happy to spend the time helping you find just the right book. One of my families favorite quirky places in Paris and a spot that should be on your "must see" list. 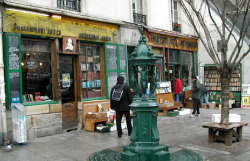 Since 1921 Shakespeare and Company has been serving as both a bookstore and a reading library. Working at the bookstore are young writers, known as "tumbleweeds" who earn their keep by working in the shop for a couple of hours each day. Children will enjoy reading books in the tiny children section upstairs and also leaving notes on the famous bulletin board. Perfect place to take a little reading break after a visit to Notre Dame.